Earlier this month, I daringly ventured into the Indian breadmaking arena. In case you missed my Aloo Paratha post, it was a challenge that turned out to be surmountable after all. My aloo balls for stuffing the paratha must have been a little on the small side though because we had some leftover aloo filling. 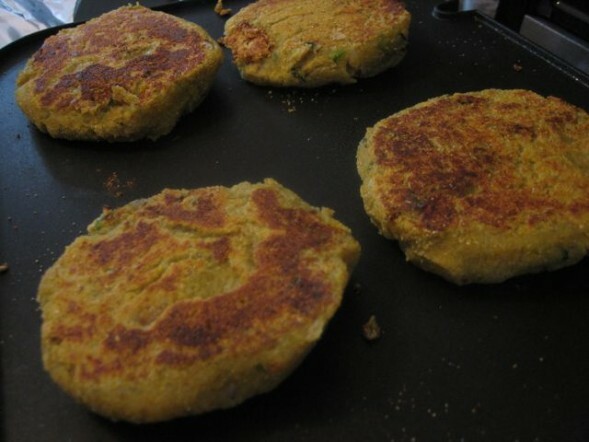 So the following Saturday afternoon, Rajat and I did an aloo tikki experiment using the leftovers. It ended well – we were left with cornmeal crusted aloo tikkis sandwiched between crusty slices of bread smeared with coriander chutney and ketchup. We washed them down with a mug of steaming chai. An ideal Saturday afternoon. I added one half a cup of pureed peas and one half a cup of pureed sweet corn to the aloo mixture before making the tikkis. It made the tikkis a little moister (which you wouldn’t want for making parathas) and heartier. I’ve copied the aloo mixture from the Aloo Paratha post below with adjusted measurements to make following it a little easier. *Amchur powder gives the potato filling a tangy, sour kick. You can substitute chaat masala or anardhana (pomegranite powder). If you don’t have any of those, use a splash of lemon juice. **You could also substitute breadcrumbs for the cornmeal. 1. Take the boiled and peeled potatoes and finely mash them. You should use a masher or ricer, but seeing as we don�EUR(TM)t own either of those kitchen utensils, we used our hands and a wooden spoon. Try to get as many lumps out of the potatoes as possible b/c they make rolling difficult. 2. Chop the tomato in half and then squeeze the water out like you would squeeze a lemon. The seeds and tomato juice should come out. 3. Finely dice the tomato and the onion and mix it into the aloo along with the green chilis. 4. Microwave or boil the peas and corn (you can combine them). Puree in a food processor until creamed and then mix into the aloo. 5. Mix in the cilantro and spices. Adjust the spice and salt to taste. If the aloo tastes under spiced, just add a little of each dry masala in a similar proportion. 6. Mix about 1 cup of the cornmeal into the mixture. This will help to firm up the mixture. Keep the remaining cornmeal in a bowl for coating the tikkis. 7. Tear off portions of the aloo mixture and gently roll into balls between your palms. Then pat it into a circular patty. Coat it with the cornmeal on all sides. 8. We used our Cuisinart Griddler for cooking the patties. Using the flat plates, heat to high and then spray the grill plates with EVOO cooking spray. Grill the tikkis until golden on each side. 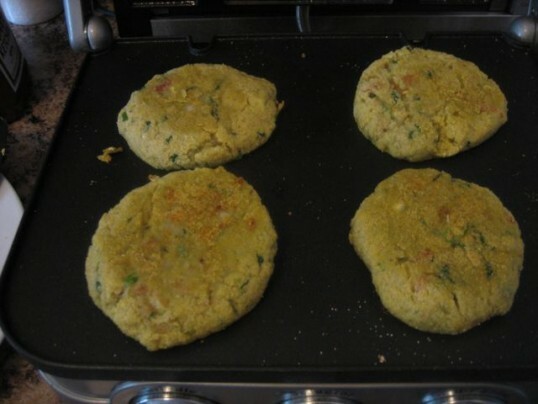 You can also pan fry the tikkis on a hot skillet using a little oil. 9. Smear the two outer sides of bread slices with butter. Put them on the grill buttered side down and grill until slightly golden. Smear one side with ketchup and the other side with coriander chutney. 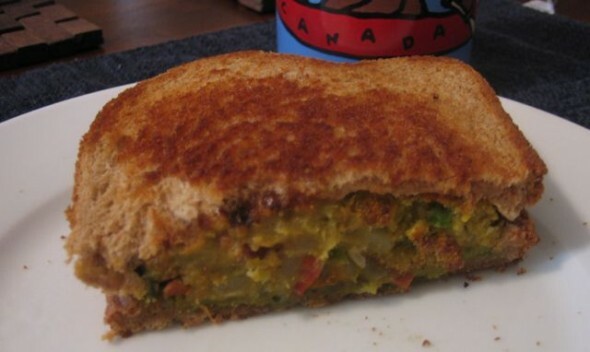 Sandwich two aloo tikkis inside then grill again until the bread is completely golden and crusted. Enjoy! Sara, give it a try – these would be a good start to Indian food since you could make these very un-spicey if you wanted, as an intro to Indian food. Good luck! Kevin, my next sandwich may just be with your curried, breaded mushrooms. Yum. Just what I need right now….what a perfect brunch idea..! Trupti, did you make them for brunch? How’d it go? Looks tempting and perfect !